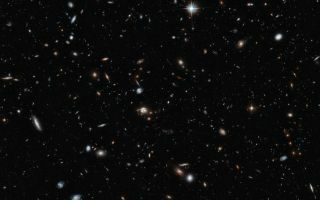 This space wallpaper of a galaxy cluster taken by the NASA/ESA Hubble Space Telescope gives a remarkable cross-section of the Universe, showing objects at different distances and stages in cosmic history. This space wallpaper of a galaxy cluster taken by the NASA/ESA Hubble Space Telescope gives a remarkable cross-section of the Universe, showing objects at different distances and stages in cosmic history. They range from cosmic near neighbors to objects seen in the early years of the Universe. The 14-hour exposure shows objects around a billion times fainter than can be seen with the naked eye. This image was released April 17, 2014.